Ray Magic is a pre-fab sandwich assembly with embedded hydronic circuit (patent pending). The panel assembly consists of a 11⁄2” thick pre-formed EPS board (1) and a gypsum panel (6) bonded together. In between the two is the radiant transfer system consisting of 18 gauge (0.05”) aluminum heat transfer plates (2) with snap channels holding the radiant tubing (5). There are two symmetrical radiant serpentine circuits. Each circuit is connected to return and supply lines (4) that run along the length of the panel (the backbone of the fluid distribution). Connections are made at the two opposite terminals of the backbone supply and return lines with a three-way coupling adapter (3). On the surface of the gypsum board are laser engraved piping footprint (7) and screw template (8). 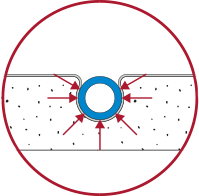 To access the connection, a semicircular cut is performed into the gypsum panel. Semicircular drywall patches (9) are supplied with the panel. Preformed to host the heat transfer plates. 18 gauge (0.05”) sheet metal pressed in “omega” shaped channel. This increases the surface of contact improving the heat conduction between the pipe and the aluminum plate for superior heat transfer. 8mm (5/16”) O.D. Dowlex PERT radiant tubing with EVOH oxygen barrier inserted into the snap channels. Snapped into the heat transfer plates channels are two symmetrical serpentine circuits (60ft long each). Pre-insulated 5/8” Pex-Al-Pex sliding backbone supply and return lines. 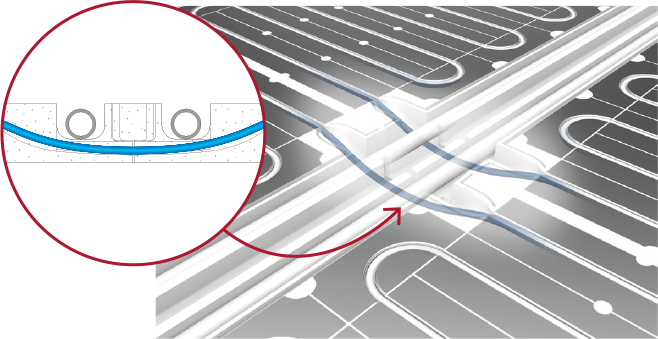 The supply and return lines are embedded in a pre-formed channel in the EPS substrate that allows moving in and out. 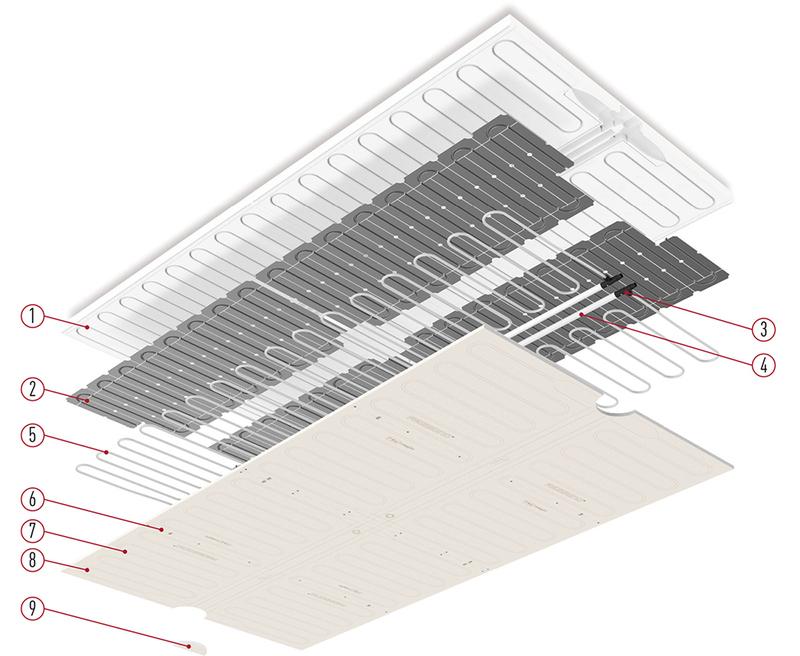 Each backbone line is terminated with a with a three-way coupling adapter for the internal connection of the radiant piping to the backbone line and to allow the quick and easy interconnection between adjacent panels through the revolutionary snap-in Magic adapter. 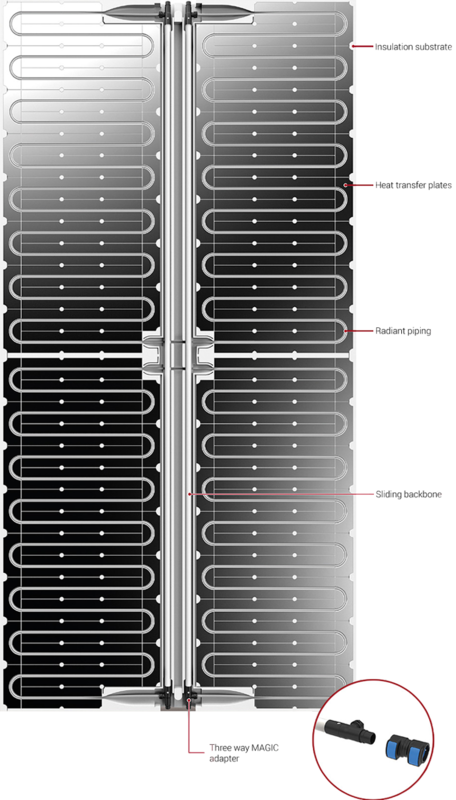 Central crossing point between the backbone lines and the hydronic circuits. This special design is fundamental to allow the cut of the panel along its axis of symmetry into sub-modular panels (4’x4’, 2’x8’ and 2’x4’).